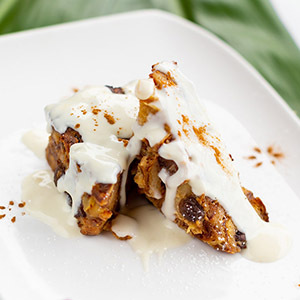 A homemade Hawaiian bread pudding with pineapple and walnuts, finished with a warm Jack Daniel’s sauce. Light and fluffy cake with shredded coconut & dark rum. Whipped cream frosting, and pineapple rum sauce. 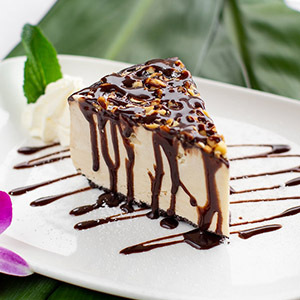 A creamy layered Bailey’s liqueur flavored ice cream on top of an Oreo cookie crust and finished with chocolate fudge and Macadamia nuts. A Billy’s favorite! 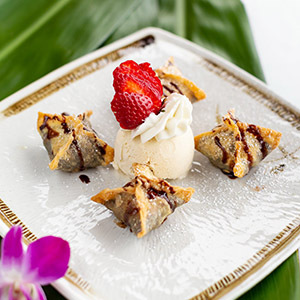 Chocolate and Banana wrapped in a wonton, fried to perfection, served with a scoop of vanilla ice cream and fresh strawberries. An original Key West recipe. Served with whipped cream.